Cruising Sydney Harbour since 1987, Sydney Showboats is an Australian-owned dinner cruise 'institution' in a realm of its own among the many standard Sydney Harbour cruises available to locals and interstate or international Sydney sightseeing visitors. During our 22 years of Sydney cruising, we have welcomed almost four million guests aboard our two luxurious paddlewheelers, with half of them being international tourists seeking a unique Sydney Harbour sightseeing experience. At capacity, we can cater for 600 guests aboard our two Sydney Showboats paddlewheelers, and we offer fantastic packages for corporate events, parties and special event cruises such as New Year's Eve and Australia Day. Our sensational cruise live show features cabaret performances from our glamorous Moulin Rouge show girls in their extravagant glittery costumes; our talented show MC songstress and dancer; and 'Mr Showboat', our charismatic comic magician who has been entertaining Sydney Showboats guests for more than 10 years. 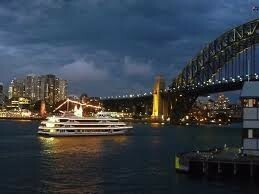 Our Sydney Harbour dinner cruise wait staff are friendly, professional and highly-trained. Our people are like family and look after our guests with courtesy, respect and attention. Our Executive Chef, Ian Crotty, and his team use only the finest ingredients all freshly prepared on board to create high quality a la carte meals designed to rival the best Sydney Harbour restaurants. We look forward to seeing you on board soon!